Despite what you may have been thinking, we have not abandoned working on the mudroom. In fact, we now have lockers…painted lockers. 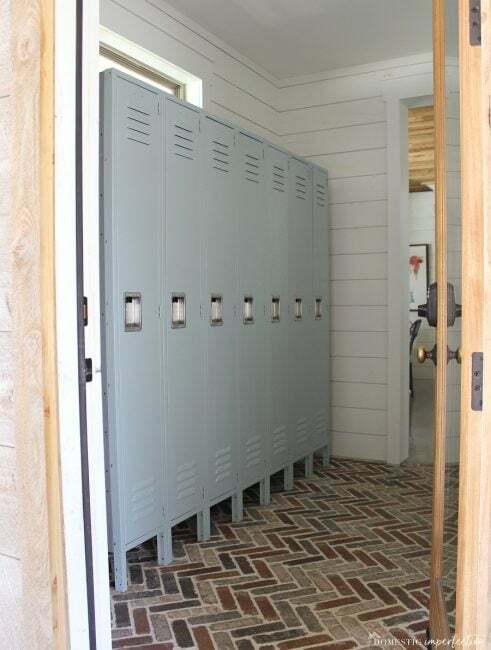 Beautiful, functional painted lockers. I love them, and the room is so close to being finished I can taste it. We pretty much just have to build them in and add decor, and it this room will look just like the plan! So let’s talk about these lockers. 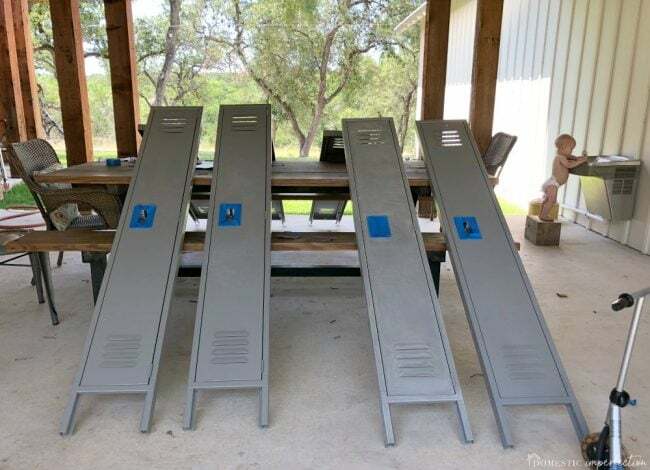 The original plan called for six 78 x 15 single tier lockers, and I wanted to buy used ones to save money and add character. So I started searching. 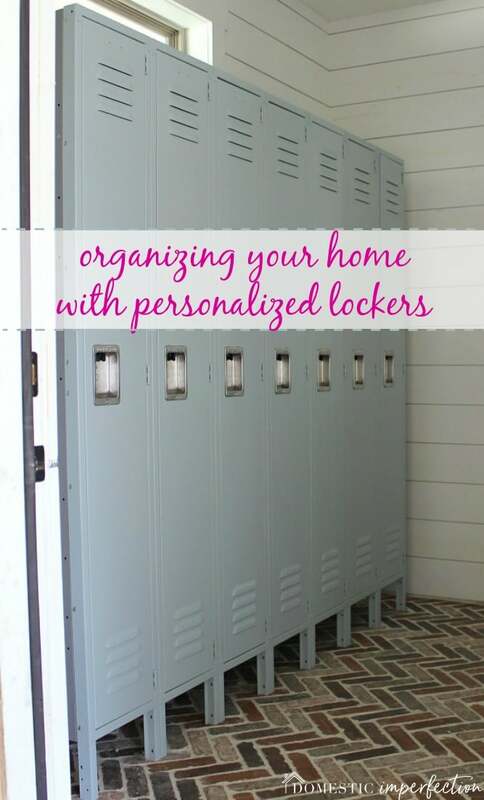 I searched all the used lockers sites, I scoured craigslist, facebook marketplace, everywhere. I collected a stack of quotes on lockers I thought would work, and each quote came back almost exactly the same….about $1200 with shipping. Eeesh. Craigslist and Facebook had a few that would work for about $600, but they were all double tier (two doors per column instead of one). I was about to pull the trigger on one of these, but then one day I got an email from Home Depot. I subscribe to a few of their e-mails, and one which shows me their deal of the day. And the deal of the day that day was…you guessed it…lockers. Y’all, I hadn’t even thought to look at Home Depot for lockers. 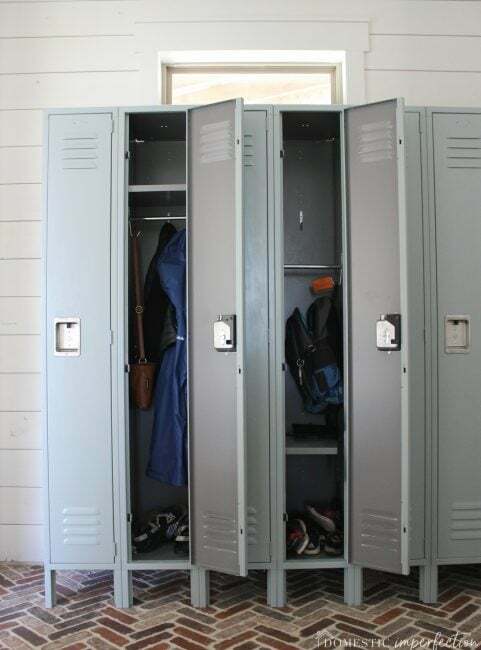 The deal was for a 78 x 12 set of three lockers for $215 with free shipping. They were a bit narrower than I had planned originally, but I cared not and bought two sets immediately. Admittedly was pretty excited about my deal, and I also felt like an idiot for spending two weeks searching for used lockers that were all way too expensive. I did the same thing with the brick pavers, looked for unique ones that were really pricey for way too long, then found exactly what I wanted at Home Depot. 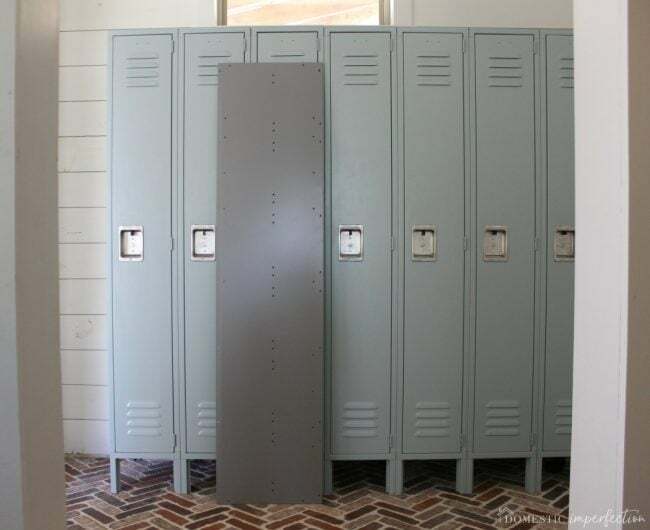 There was one problem with my locker score though…they were gray, and I wanted blue. Normally I’m not hesitant to paint things, if I don’t like something I’ll slap a coat of paint on it without a second thought. But these are a powder-coated metal and are made to take a beating, which my boys will surely administer. Plus there was the whole issue of my husband, who was very anti painting them. He was (still kinda is) 100% sure I would ruin them, which of course meant I was definitely going to paint them, somehow. After unsuccessfully attempting to hire an auto body shop to paint them (the perfect compromise…except for the $750 price tag), I started looking into DIY options for painting metal. My first thought was spray paint, and I bought two colors to try. I think this would have worked great, the problem is that spray paint only has a few color options and they are all fairly bright. The two dullest shades of blue I could find looked pretty pure and not at all like what I had in mind. Next I turned to Google, which told me chalk paint was the answer. No sanding, no priming, just use chalk paint and be done. This sounded great…too great actually. I’m always suspicious of things that sound too good to be true, and I this one definitely did. So I decided to go the old tried and true labor-intensive route. It worked for me once at the last house when I painted a metal shed, and hopefully, it would work on these as well. Cleaning supplies, which will vary depending on how old/dirty they are. 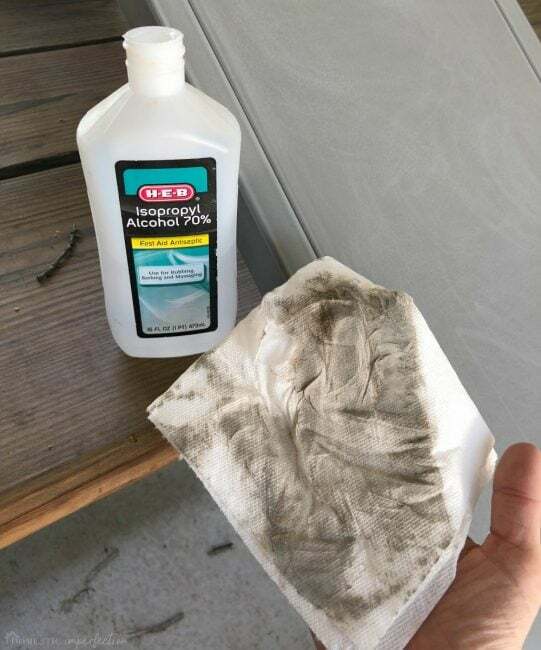 I just used a paper towel and rubbing alcohol. Since my lockers were new there wasn’t any need for rust removal, so I just sanded them a bit to rough up the surface (if you do have rust TSP is cheap and works wonders). 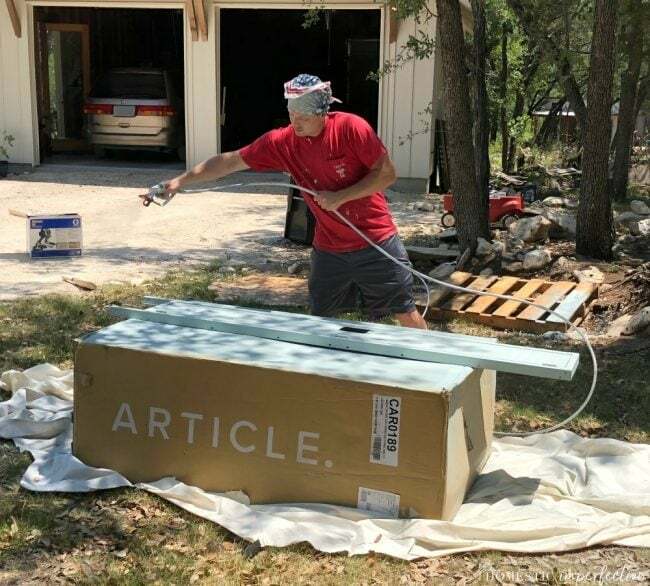 After sanding you need to make sure the surface is clean and dry to be ready for primer. I used a paper towel and rubbing alcohol to get all the dust off. 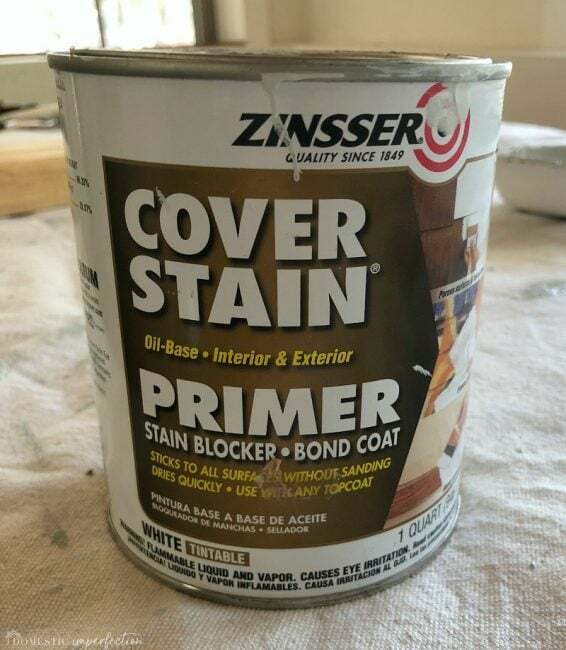 For this I chose to use Zinsser Cover Stain, which is an oil-based primer. 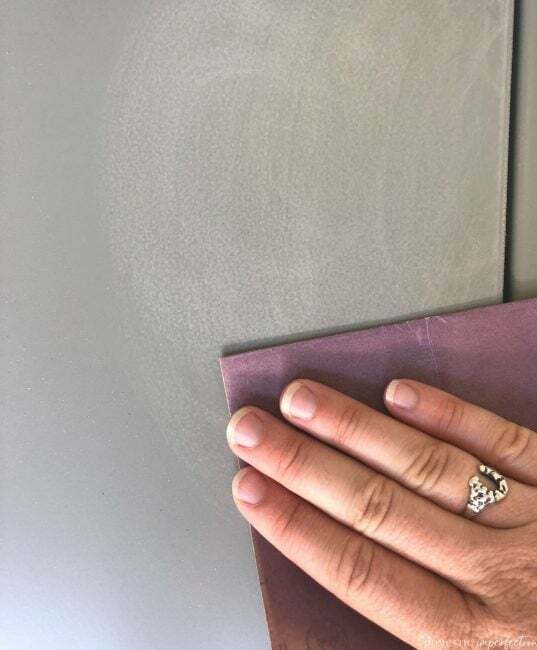 We used the same thing for the kitchen cabinets and it’s the best, and despite the old “oil and water” rule you can (and should) use it with a latex paint over top. They sell it in a spray can as well, but I chose not to use it because wanted to tint the primer, plus the spray cans were pretty pricey. And since cleaning oil based paint out of the paint sprayer didn’t sound like my idea of a good time, a paintbrush it was (followed by more sanding). 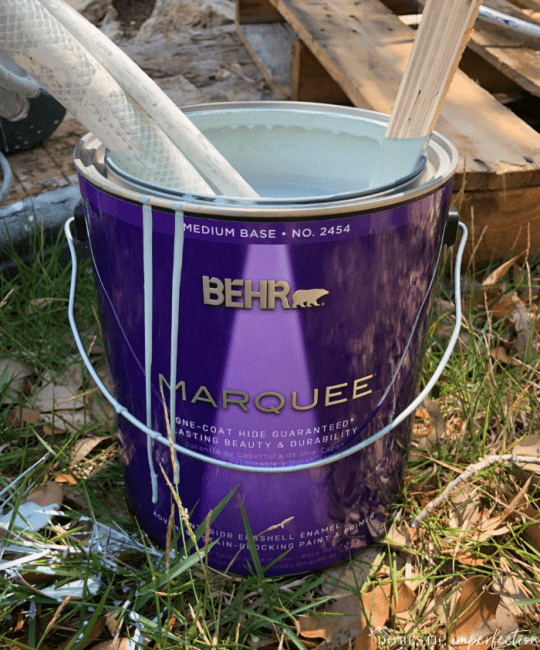 For this I chose to use Behr Marquee in the color Frozen Pond. Its a really pretty light blue color that will look great with the brick floor. When I showed Adam the color he said “So…gray. We’re painting gray lockers gray.” and I replied “It’s not gray, it’s more like a smoky aqua” and I don’t ever think I’ve ever seen him roll his eyes so hard, haha. And then he busted out the paint sprayer and sprayed them for me, because he’s cool like that. In hindsight, we definitely should have sprayed the sealer as well, because nothing compares to the flawless finish a paint spray provides. In reality, our shoe-obsessed toddler had been taking advantage of the doorless lockers, and made it his mission in life to scatter shoes around the house and yard every waking second. After frantically looking for six peoples shoes every time we had to leave the house I couldn’t get the doors back on fast enough. I actually ended up putting three different coats of sealer on the lockers, trying to get a finish that wasn’t streaky. In the end, the matte finish from Varathane was by far the best (although I took these “final” pictures after the first streaky coat). The good news is that they are extra sealed now. 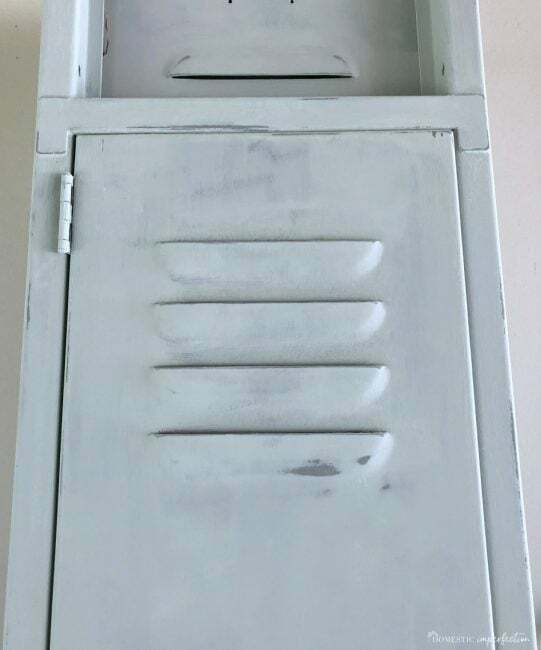 So here are the finished lockers, along with a leftover panel of the original color (so you don’t think I’m crazy for painting gray lockers gray). I love them, painting them was totally worth it. 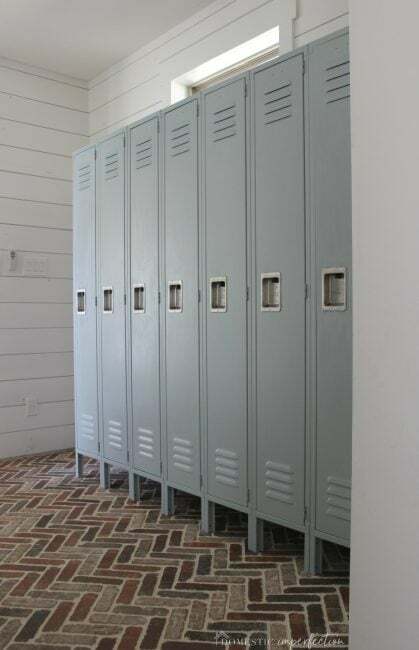 The original gray color actually matched the brick floor really well, but to me they just looked like lockers out of a mechanic shop. 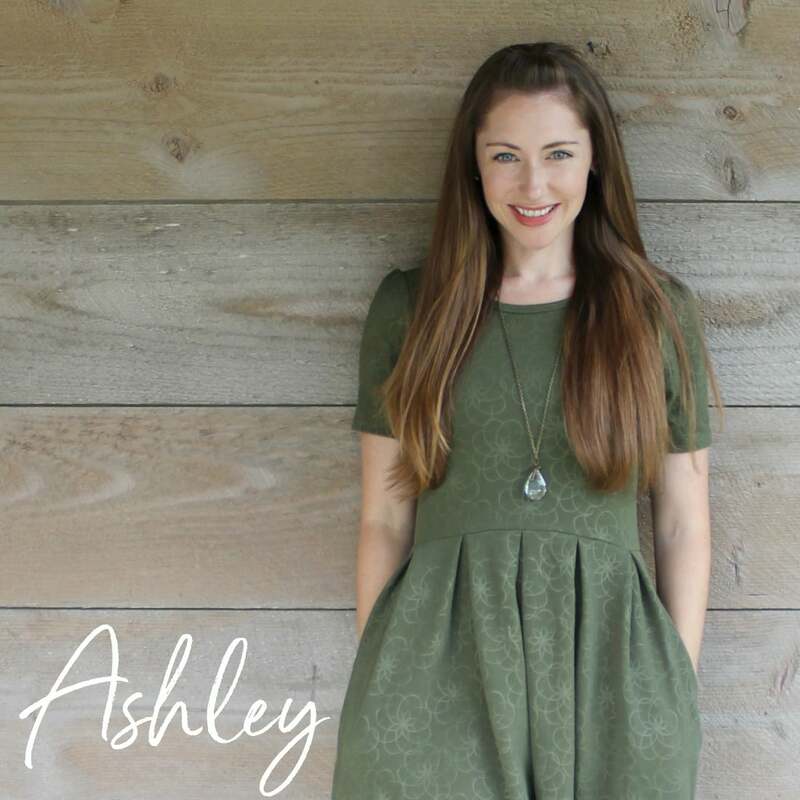 The beauty of DIYing your home is that the final product is personalized and one of a kind, which is exactly what I want our home to be. 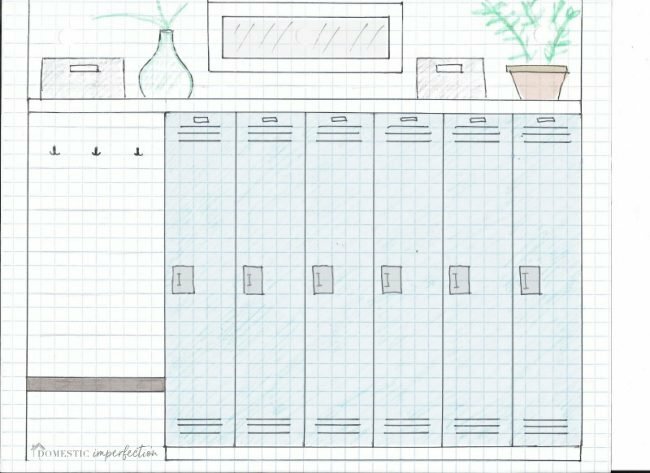 And in case you are counting, yes, there are now seven lockers, and no, I am not pregnant. We ended up buying an extra one to store brooms and mops, which we had room for since the lockers were each three inches narrower than I had planned. Funny how it all works out in the end. So that’s the story of the painted lockers, just a few steps left and we can call this room finished! Can you comment on how you painted the hinges? And their functionality afterwards? I would be scared they would either be too coated with paint to function properly and/or they would wear immediately and expose the old grey. Curious. Thanks! I didn’t do anything special for the hinges, I coated them in primer, paint and sealer just like the rest. They function just like they did before, and hopefully they hold up over time. I think they will, since nothing really rubs, just turns. 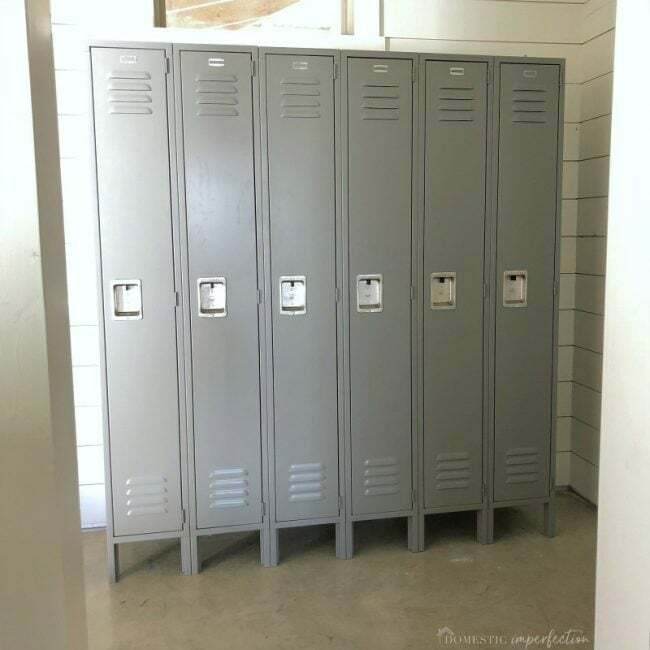 Okay,you definitely Painted gray lockers gray! 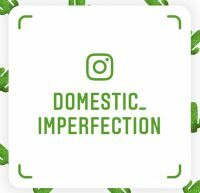 It is a more designer-ish, less auto shop gray for sure though so I’ll give you that. I would probably have done the same in your place :) I have high hopes they will hold up against your boys! The old slow way of refinishing is tried and true. I do NOT think you are crazy for painting your gray lockers gray. LOL. The new color is GORGEOUS. Great choice! Are the lockers covering the window?! No, the window starts about eight inches above the lockers. 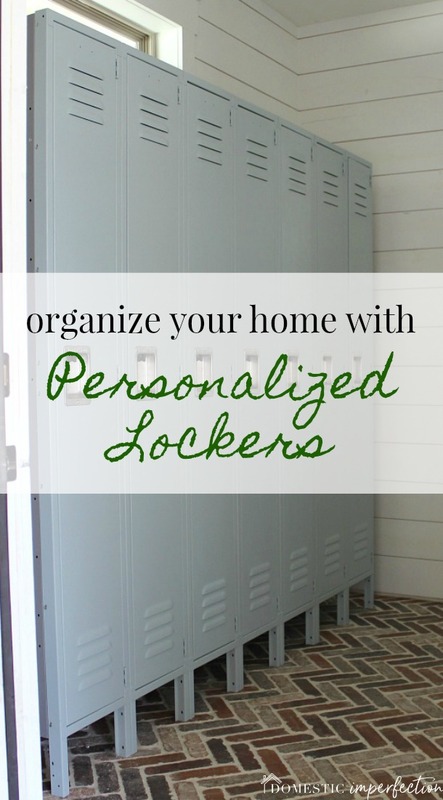 I noticed that your Home Depot link is to 3 unit lockers. Looks like you have 7 lockers… were you able to purchase singles as well? Do the three unit lockers come apart? Yes, we originally planned six lockers (one for each person) and bought two 3 unit sets. Then last minute we decided to add a seventh for brooms and mops and bought a single. If you bought a triple unit you can’t use them individually, there aren’t enough side pieces included.